No matter what brings you to Missoula–school, work, skiing or hiking–you will want to eat. Our Missoula Bed and Breakfast is a good place to start a culinary tour of Missoula. Each morning during your stay, we’ll prepare an abundance of fresh food for you; perhaps delicate crab crepes or fresh, hot, sweet cinnamon rolls (homemade, of course). We’ll drown you in coffee, if that’s how you like to wake up, or wow you with fresh fruit juices. You may not need to eat again until dinner time. Yet eat again you eventually will. Fortunately, Missoula has several good restaurants. Blue Canyon Kitchen & Tavern has a casually elegant atmosphere and offers a fresh twist on many old favorites. Diners may bask in the warmth of the fireplace or sit at the counter and watch what’s happening in the kitchen. The daring are invited to sit at the Chef’s Table, where they work with the culinary team to craft a unique four- or five-course meals with wine pairings. The Shack Cafe has been feeding Missoulans since 1949. Today, much of the menu is built around locally grown and raised food. This is a good spot for lunch (if you’re still hungry after the breakfast at Blue Mountain Inn). Their dinner specials are very good, too. Tipus offers a taste of East India. When you’re in the mood to feast on samosas and drink buckets of chai, this is the place for you. Lolo Creek Steakhouse is a wonderful spot to dine, especially after a day spent out-of-doors. The amazing indoor grill, made from stone and iron, is a wonder to behold. The steaks prepared on it are delicious. Nordic skiers take note! 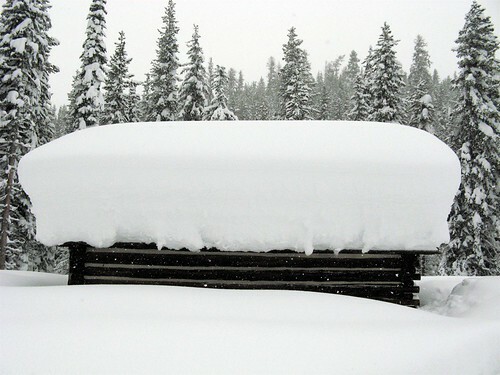 The Lolo to Lochsa Ski Tour is scheduled for Saturday, March 10, 2012. 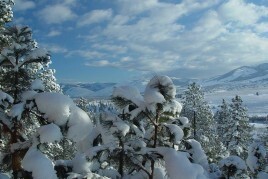 Book your rooms at Blue Mountain Missoula Bed and Breakfast soon. 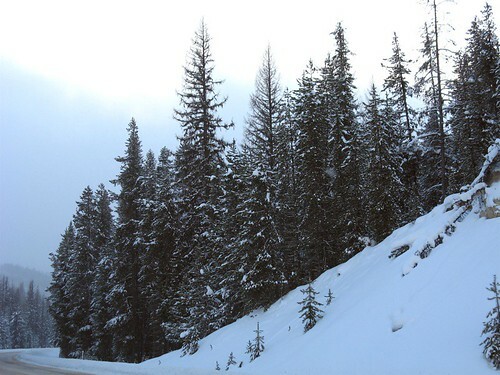 Skiers will be rewarded with beautiful scenery on the ski tour to Lochsa Lodge. Some skiers who complete the Lolo to Lochsa Tour will win door prizes after the race, but the biggest reward is simply how good it feels to successfully ski 35 km (22 miles) in one day. 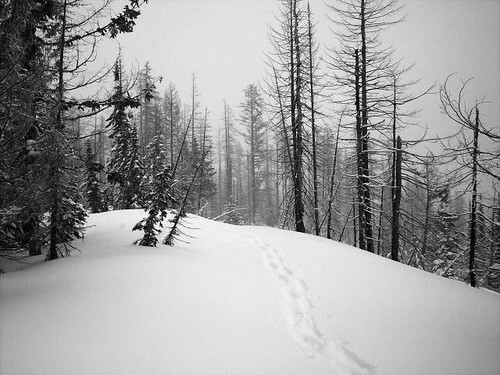 The trail from Lolo Pass to Lochsa Lodge is groomed for classic and skate skiing. Much of the terrain is relatively flat or gently rolling, though there is one good climb and one fun descent. One thing is certain, the after race refreshments and snacks will be much appreciated! Pamper yourself before and after the race. Stay at Blue Mountain Missoula Bed and Breakfast. 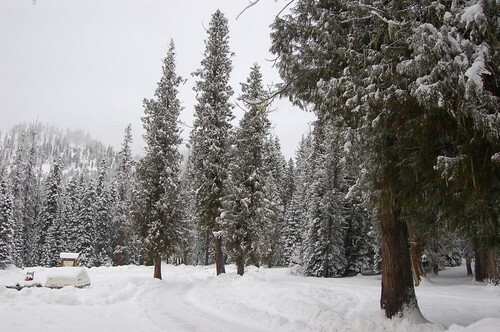 Additional details about the Lolo Pass to Lochsa Lodge Ski Tour may be found at Missoula Nordic. 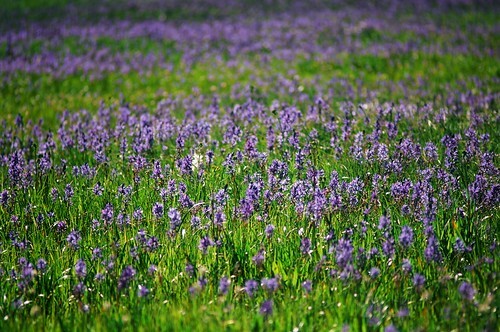 Camas blooming in Packer Meadows. A few nights at our Missoula Bed and Breakfast is the perfect way to celebrate any special occasion. Plan to bring your father (or the father of your children) here over Father’s Day, which takes place June 19, 2011. Treat your spouse to a romantic getaway here on your anniversary. 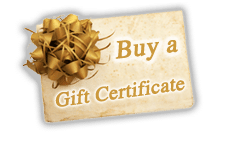 Bring your mother, your spouse, your child or your best friend to our Montana Bed and Breakfast on their birthdays. The best gift you can give a person is the gift of time. This is especially true for people who don’t get to spend enough quality time together. If you live far from your parents, what a treat to spend a few days here, away from all routines. If you haven’t had a date with your spouse since 2008, what better way to say “I love you” than to whisk him or her away for a romantic getaway in Missoula? You get the picture. Folks who enjoy outdoor recreation will find the area in and around Missoula full of possibilities. Nearby Pattee Canyon Recreation Area has picnic sites and miles of trails suitable for hiking, mountain biking, and horseback riding. There is whitewater rafting on the Blackfoot River, the Clark Fork River, and the Bitterroot River. Nearby Lolo Pass is an ancient trail long used by Native Americans and later used by Lewis and Clark; there is a wonderful 8-mile hike from Lolo Pass to Packer Meadows that is particularly lovely in late June and early July, when wildflowers are blooming. Downtown Missoula has many eclectic shops and art galleries. Guests of our Missoula Bed and Breakfast who find urban hikes more compelling than mountain hikes will find Missoula fun to explore. Carousel Park hosts a Sunday Market and Festival each week during the summer, where vendors sell fresh produce and a variety of home-spun products. There are several restaurants in Missoula appropriate for celebratory dinners. The Silk Road bills itself as “Missoula’s newest adventure in global cuisine and old-world hospitality”. It features an impressive number of wines by the glass and tasty, creative dishes from all over the world. The Pearl Cafe features hearty Montana cuisine made with the freshest local and organic ingredients. Menus change with the seasons. The menu also changes frequently at The Red Bird, which serves sustainably grown fresh foods. Live music accompanies diners most Monday evenings. One of the most delightful aspects of our work is helping guests of our Missoula Bed and Breakfast celebrate their special occasions. The Bitterroot Valley from a distance. Travelers staying at our Montana bed and breakfast for the first time may be interested in our Trails and Tales Tour. This is a wonderful way to become acquainted with the area. After you’ve made yourself comfortable either in our Missoula Lodge or under trees in our forested picnic area, we’ll regale you with an oral history of the Bitterroot Valley and Missoula. We tell the tales through stories and songs. 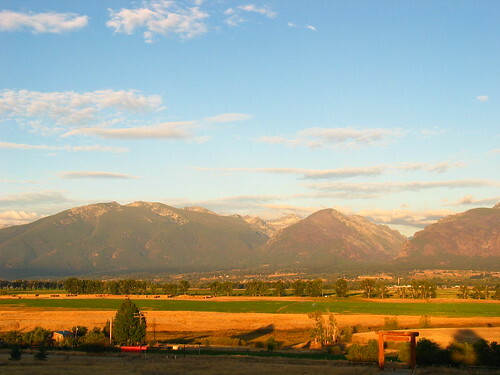 The Missoula Valley has long been a natural travel corridor. Native Americans from the mountain ranges, the Columbia Plateau and the Pacific Slope all passed through here on their way to hunt buffalo on the plains. Indeed, the Bitterroot Valley takes its name from the bitterroot that grew so abundantly here and was harvested each year by the Salish, who used the roots both for medicine and food seasoning. Lewis and Clark followed the trails long traveled by Native Americans. They passed through this area twice, stopping in what is now Traveler’s Rest State Park in September of 1805 and June/July, 1806. Lolo Hot Springs, Lolo Pass, and Packer Meadows were all explored by the expedition. French trappers, explorers, and Catholic missionaries traveled the region widely from about 1815 on, and in the 1860s, European settlers began coming here to stay. 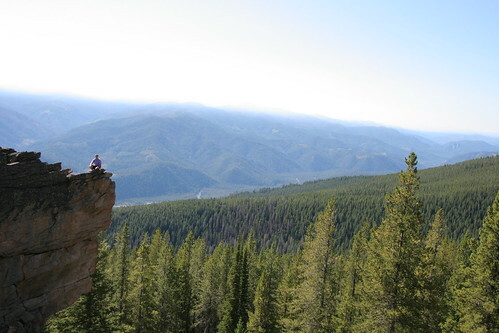 The history of Montana is rich and wonderful, and we can only scratch the surface of it with our Trails and Tales Tour. Our hope is to orient you to the region in a unique and pleasant way. After an hour learning about the region in comfort at our Missoula bed and breakfast, head out to explore, either on your own, with us, or with a locally established historian (advanced reservations are required).